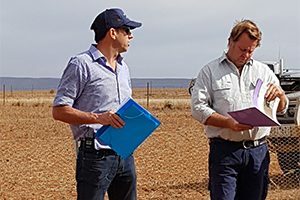 The PPWCMA, Precision Agriculture and Balliang Food and Fibre Group recently ran a field day for cereal growers in the west of the Port Phillip and Western Port region. The focus of the event was the results from recent trials looking at their philosophy of continuous improvement and precision technology to adopt variable fertiliser rates. The trials really highlighted that soils had ample available nitrogen, negating the need for topdressing and still achieve a target 3t/ha wheat crop. Similar positive data showed that when precision technology is used to map lime requirements based on soil pH analysis, not only was there an economic benefit through reduced input costs, there is also improved yield potential. These trials were funded by the Victorian Government to demonstrate farming environmental stewardship. A complete case study is available via the below link. For more information contact the PPWCMA’s Regional Agricultural Facilitator, Karen Thomas, on 03 8781 7900 or karen.thomas@ppwcma.vic.gov.au.